ASIA NEWS REPORT: The bishop emeritus of Hong Kong confirms the information published in recent days by AsiaNews and reveals details of his conversation with Pope Francis on these topics: "Do not create another Mindszenty case", the primate of Hungary whom the Vatican forced to leave the country, appointing a successor in Budapest, at the will of the communist government of the time. Hong Kong (AsiaNews) – Below we publish the article that Card. Joseph Zen, bishop emeritus of Hong Kong, posted today on his blog, regarding the events reported by AsiaNews where a Vatican prelate asked the bishops of Shantou and Mindong, underground and recognized by the Holy See, to step down to leave their place to two illegitimate and excommunicated bishops. Since AsiaNews has revealed some recent facts in the Church in mainland China, of legitimate bishops being asked by the “Holy See” to resign and make place for illegitimate, even explicitly excommunicated, “bishops”, many different versions of the facts and interpretations are creating confusion among the people. Many, knowing of my recent trip to Rome, are asking me for some clarification. Back in October, when Bishop Zhuang received the first communication from the Holy See and asked me for help, I send someone to bring his letter to the Prefect of the Congregation for the Evangelization of Peoples, with, enclosed, a copy for the Holy Father. I don’t know if that enclosed copy reached the desk of the Holy Father. 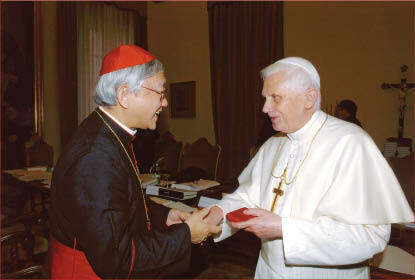 Fortunately, Archbishop Savio Hon Tai Fai was still in Rome and could meet the Pope in a fare-well visit. In that occasion, he brought the two cases of Shantou and Mindong to the knowledge of the Holy Father. The Holy Father was surprised and promised to look into the matter. Given the words of the Holy Father to Archbishop Savio Hon, the new facts in December were all the more a shocking surprise to me. When the old distressed Bishop Zhuang asked me to bring to the Holy Father his answer to the message conveyed to him by the “Vatican Delegation” in Beijing, I simply could not say “No”. But what could I do to make sure that his letter reach the Holy Father, while not even I can be sure that my own many letters did reach him. To make sure that our voice reached the Holy Father, I took the sudden decision of going to Rome. I left Hong Kong the night of 9th January, arriving in Rome the early morning of 10th January, just in time (actually, a bit late) to join the Wednesday Public Audience. At the end of the audience, we Cardinals and Bishops are admitted to the “bacia mano” and I had the chance to put into the hands of the Holy Father the envelop, saying that I was coming to Rome for the only purpose of bringing to him a letter of Bishop Zhuang, hoping he can find time to read it (in the envelop there was the original letter of the Bishop in Chinese with my translation into Italian and a letter of mine). For obvious reasons, I hoped my appearance at the audience would not be too much noticed, but my late arrival in the hall made it particularly noticeable. Anyway, now everybody can see the whole proceeding from the Vatican TV (by the way, the audience was held in Paul VI Hall, not in St. Peter’s Square and I was a little late to the audience, but did not have to “wait in a queue, in a cold weather”, as some media erroneously reported). When in Rome, I met Fr. Bernard Cervellera of AsiaNews. We exchanged our information, but I told him not to write anything. He complied. Now that someone else broke the news, I can agree to confirm it. Yes, as far as I know, things happened just as they are related in AsiaNews (the AsiaNews report “believes” that the Bishop leading the Vatican Delegation was Msgr. Celli. I do not know in what official capacity he was there, but it is most likely that he was the one there in Beijing). In this crucial moment and given the confusion in the media, I, knowing directly the situation of Shantou and indirectly that of Mindong, feel duty-bound to share my knowledge of the facts, so that the people sincerely concerned with the good of the Church may know the truth to which they are entitled. I am well aware that in doing so I may talk about things which, technically, are qualified as “confidential”. But my conscience tells me that in this case the “right to truth” should override any such “duty of confidentiality”. In the afternoon of that day, 10th January, I received a phone-call from Santa Marta telling me that the Holy Father would receive me in private audience in the evening of Friday 12th January (though the report appeared only on 14th January in the Holy See bulletin). That was the last day of my 85 years of life, what a gift from Heaven! (Note that it was the vigil of the Holy Father’s departure for Chile and Peru, so the Holy Father must have been very busy). On that evening the conversation lasted about half an hour. I was rather disorderly in my talking, but I think I succeeded to convey to the Holy Father the worries of his faithful children in China. The most important question I put to the Holy Father (which was also in the letter) was whether he had had time “to look into the matter” (as he promised Archbishop Savio Hon). In spite of the danger of being accused of breach of confidentiality, I decide to tell you what His Holiness said: “Yes, I told them (his collaborators in the Holy See) not to create another Mindszenty case”! I was there in the presence of the Holy Father representing my suffering brothers in China. His words should be rightly understood as of consolation and encouragement more for them than for me. I think it was most meaningful and appropriate for the Holy Father to make this historical reference to Card. Josef Mindszenty, one of the heroes of our faith. (Card. Josef Mindszenty was the Archbishop of Budapest, Cardinal Primate of Hungary under Communist persecution. He suffered much in several years in prison. During the short-lived revolution of 1956, he was freed from prison by the insurgents and, before the Red Army crashed the revolution, took refuge in the American Embassy. Under the pressure of the Government he was ordered by the Holy See to leave his country and immediately a successor was named to the likings of the Communist Government). With this revelation, I hope I have satisfied the legitimate “right to know” of the media and of my brothers in China. Oremus pro Pontifice nostro Francisco, Dominus conservet eum et vivificet eum et beatum faciat eum in terra et non tradat eum in animam inimicorum eius. Some explanations may still be in order. Please, notice that the problem is not the resignation of the legitimate Bishops, but the request to make place for the illegitimate and even excommunicated ones. Many old underground Bishops, though the retirement age law has never been enforced in China, have insistently asked for a successor, but have never received any answer from the Holy See. Some others, who have a successor already named, may be even already in possession of the Bulla signed by the Holy Father, were ordered not to proceed with the ordination for fear of offending the Government. 2. I have talked mainly of the two cases of Shantou and Mindong. I do not have any other information except the copy of a letter written by an outstanding Catholic lady, a retired University professor well-acquainted with affairs of the Church in China, in which she warns Msgr. Celli against pushing for the legitimization of “bishop” Lei Shi Ying in Sichuan. 3. I acknowledge myself as a pessimist regarding the present situation of the Church in China, but my pessimism has a foundation in my long direct experience of the Church in China. From 1989 to 1996 I used to spend six months a year teaching in the various Seminaries of the official Catholic community. I had direct experience of the slavery and humiliation to which those our brother Bishops are subjected. And from the recent information, there is no reason to change that pessimistic view. The Communist Government is making new harsher regulations limiting religious freedom. They are now strictly enforcing regulations which up to now were practically only on paper (from the 1st of February 2018 attendance to Mass in the underground will no longer be tolerated). 4. Some say that all the efforts to reach an agreement is to avoid the ecclesial schism. How ridiculous! The schism is there, in the Independent Church! The Popes avoided using the word “schism” because they knew that many in the official Catholic community were there not by their own free will, but under heavy pressure. The proposed “unification” would force everybody into that community. The Vatican would be giving the blessing on the new strengthened schismatic Church, taking away the bad conscience from all those who are already willing renegades and those others who would readily join them. 6. So, do I think that the Vatican is selling out the Catholic Church in China? Yes, definitely, if they go in the direction which is obvious from all what they are doing in recent years and months. 7. Some expert on the Catholic Church in China is saying that it is not logical to suppose a harsher religious policy from Xi Jinping. However, we are not talking about logical thinking, but the obvious and crude reality. 8. Am I the major obstacle in the process of reaching a deal between the Vatican and China? If that is a bad deal, I would be more than happy to be the obstacle.